Partly cloudy this evening followed by increasing clouds with showers developing after midnight. Low 53F. Winds S at 5 to 10 mph, becoming WNW and increasing to 10 to 20 mph. Chance of rain 60%. Nebraska teammates react to Malcolm Laws (3) as he dances Sunday following a 76-64 win over Penn State at Pinnacle Bank Arena. 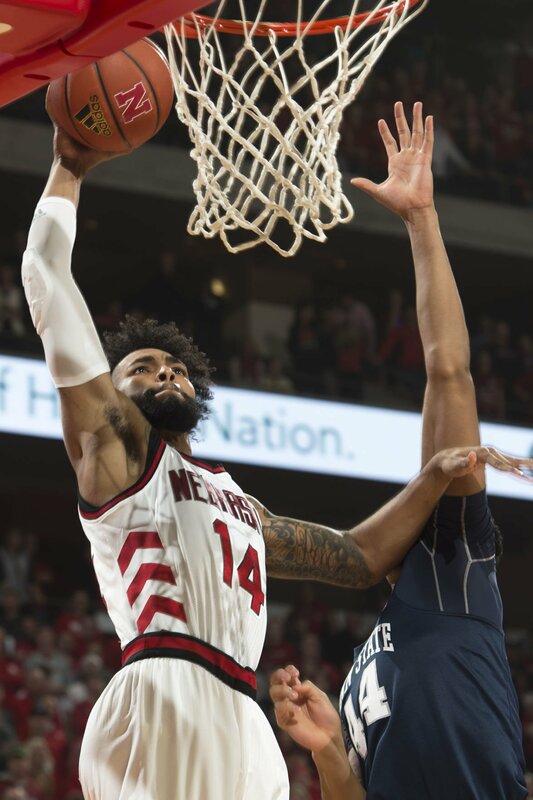 Nebraska forward Isaac Copeland (14) scores against Penn State forward Julian Moore (44) on Sunday at Pinnacle Bank Arena. It was a throwback kind of day Sunday at Pinnacle Bank Arena. From the jerseys to the rowdy crowd to the final score, it sure looked a lot like those early 1990s Nebraska basketball teams that used to go to the NCAA Tournament with such regularity. The 2018 version of the Huskers isn't there yet. But they're as close as this program has been in a while. And a historic 76-64 victory over Penn State in front of a sold-out PBA crowd moved Nebraska one step closer to that goal. With NCAA Tournament selection committee chairman Bruce Rasmussen in the building to see NU in person for at least the third time this season, the Huskers led by double digits for the game's final 30 minutes, and by as many as 21 at one point, against a team fighting for its own tournament life. So, if they could deliver a message to Rasmussen after a splendid senior day performance, what would it be? "Let us in," sophomore center Jordy Tshimanga said. The message has been sent on the court. Nebraska finished the regular season 22-9, and 13-5 in the Big Ten. The 22 wins are the second-most in a season in school history, and the most since the 1990-91 team won 26. The 13 league wins are a school record. The 16 home wins are one short of the school record, and the 16-1 record in PBA was the best home mark since 1982-83. The Huskers have won 10 of their past 12 games, and Sunday a dominant defense held Penn State (19-12, 9-9 Big Ten) to 17 first-half points — the fewest the Huskers have allowed and the fewest the Nittany Lions have scored in a half this season. It was a 17-point lead at the break. Penn State tried to make it interesting late. But the Nittany Lions never got closer than 12 points as a near-record PBA crowd roared its approval time and again. The paid attendance of 15,991 was the second-largest crowd in Pinnacle Bank Arena history, just seven behind the mark set in the No-Sit Sunday victory over Wisconsin to end the 2013-14 regular season. "It looks like a NCAA Tournament team to me," Nebraska coach Tim Miles said. "We're willing and able to play anybody." Nebraska's 46 points in the paint were a season-high against a Penn State defense playing without sophomore big man Mike Watkins, who abused NU for 20 points and 15 rebounds in the teams' first meeting this season. It started from the jump, when Isaac Copeland took a pass at the top of the key on Nebraska's opening possession, drove the lane and punched a right-handed jam over Julian Moore that sent an already riled up PBA crowd of through the roof just 14 seconds into the game. Copeland scored Nebraska's first seven points to help the Huskers settle in, and finished with 17 points, 12 rebounds and four assists. "I just wanted to do what I could to set the tone. Last time we played them, they kind of got a good lead on us. So I was upset about that game," Copeland said. "So I just wanted to come out with some energy and make some plays." Nebraska will be the No. 4 seed in this week's Big Ten Tournament at Madison Square Garden in New York City, with a double-bye into Friday's quarterfinals. The Huskers will play Illinois, Iowa or Michigan, with Illinois and Iowa meeting in a Wednesday play-in game and the winner getting the Wolverines on Thursday. "Personally I think (we're a tournament team), but we're not going to New York to just play around. We want to win that too," senior guard Anton Gill said. "We really feel like we have the best team in the Big Ten. More wins would obviously help, but if you ask me my opinion, I think we've proven throughout the year that we're a tournament team." Gill had nine points as part of a Husker lineup that had seven players score at least seven points. Isaiah Roby, after battling a case of food poisoning Saturday night, finished with 13 points, seven rebounds and three assists. James Palmer finished with 11 points, and Glynn Watson also scored 11 points on 4-of-8 shooting. Tony Carr, the Big Ten's leading scorer, had 19 of his game-high 27 points in the second half to keep things from getting completely out of hand. Lamar Stevens added 13, while Shep Garner finished with 11. They were the only three Nittany Lions to score in the first 20 minutes. There are more games to be played this season. If the Huskers have their way, there will be a lot more. They showed Sunday why that opportunity is closer than ever. Game 1: No. 13 Illinois (4-14, 14-17) vs. No. 12 Iowa (4-14, 14-17), 4:30 p.m.
Game 2: No. 14 Rutgers (3-15, 13-18) vs. No. 11 Minnesota (4-14, 15-16), after Game 1. Game 3: No. 9 Wisconsin (7-11, 14-17) vs. No. 8 Maryland (8-10, 19-12), 11 a.m.
Game 4: Game 1 winner vs. No. 5 Michigan (13-5, 24-7), after Game 3. Game 5: No. 10 Northwestern (6-11, 15-15) vs. No. 7 Penn State (9-9, 19-12), 5:30 p.m.
Game 6: Game 2 winner vs. No. 6 Indiana (9-9, 16-14), after Game 5. Game 7: Game 3 winner vs. No. 1 Michigan State (16-2, 28-3), 11 a.m.
Game 8: Game 4 winner vs. No. 4 Nebraska (13-5, 22-9), after Game 7. Game 9: Game 5 winner vs No. 2 Ohio State (15-3, 24-7), 5:30 p.m.
Game 10: Game 6 winner vs. No. 3 Purdue (15-3, 24-7), after Game 9. Game 12: Game 9 winner vs Game 10 winner, 3:30 p.m.
Game 13: Game 11 winner vs. Game 12 winner, 3:30 p.m.